Running: I am back to 4 days/week running and it feels good. This week I ran a total of 25 miles. Pacing is good. I finally committed to running the Panama City Beach half marathon in December. I'm really excited to run this one and spend the weekend with some of my running friends. I'm still considering a fall half. About that Sunday morning run: I woke up to beautiful blue skies, temperatures in the 60s, and no wind. It was a runner's dream come true! I was looking forward to my planned 10 miler and decided to run on the bike path. My only hesitation was a relative lack of water and facilities. I planned to take a gel at the only water fountain on the path. Since this is an out and back route, the water would be at miles 3.5 and mile 7.5. The portapotty is located at mile 4.5. It was the perfect start to what should have been the perfect run. What could go wrong? Do you really want me to answer that question? You know I like to keep things real here on the blog, but my story is a little TMI, so if you want to skip ahead to the yoga pictures, I wouldn't blame you one bit. My run started out smoothly and I stopped a few times to snap pictures. The sunrise was spectacular. I settled into a nice 8:45m/m pace and felt like that was sustainable for 10 miles. About mile 2, I started to feel a little rumbling from down below. The feeling passed and I stopped to gel as planned at mile 3.5. Shortly after I resumed my run, the rumbling returned with some urgency. I willed myself to hold on until I reached that portapotty at mile 4.5. Grateful for all that glute strengthening Becky has me do, I squeezed those muscles tight with all the strength I could muster while running forward. I passed some dog walkers, who smiled at me. They had no clue of my internal struggle. Like a beacon in the night, I saw the yellow portapotty calling to me. The sign on the door said Drop Zone. Oh, the irony! I picked up the lid and saw the seat was covered with sweat. Suppressing my disgust, I sat down to take care of business. I reached for the toilet paper and realized the dispenser was empty. Cursing the park district employees, I thought about what I was going to do. Desperate times call for desperate measures, and I ripped the cardboard roll off the dispenser. I tore it in half and made do with what I had. There was another roll and I used that too. I hoped it would be enough. There was hand sanitizer in the dispenser but I didn't think that was going to be adequate to clean up my hands. Thankfully, the grass was wet with dew and I gave my hands a good cleaning. I headed back to the path, where I saw the dog walkers again. They smiled and nodded at me. Oh, if they only knew. Would a civilized person do these things? With a new lightness in my step, the rest of the run was uneventful. In fact, I ran an average of 9 m/m for a total of 10.66 miles. Pretty sure all those stops slowed me down. But I kept myself entertained with thoughts about that potty stop for the rest of my run. Made a mental note to always carry wipes with me on a long run. Still, I'd call this run a success, for the most part. Wouldn't you? Yoga: I had 2 classes at the studio. Megan's class opened up our hips and shoulders again and we worked again on Bird of Paradise. Does she realize I'm in a plank challenge? I was so open after our class that I went for upward facing plank for my photo. On Wednesday, our sub was the studio owner's husband, who had us work on side planks. He talked about a master teacher who visited the studio the week before and mentioned "handstand tree pose". Always looking for fun variations, I made a mental note of that and of course had to try it after the class. Someday I will hold this pose away from the wall. Or the fence, as you see in the picture. Cross training: I do love my coach. As I mentioned last week, I've been dealing with some forearm tendonitis. Instead of telling me to take time off, which I thought she'd do, she modified my training. No pull up prep for now. She had me do some lunges, some medicine ball work, and back extensions on the GHD. Then it was over to the boxes to do some modified dips. Overall, I am reaping big time rewards from this upper body work. My yoga poses have become easier. When I was kicking up into that handstand on the fence, I took about 5 pictures but I never felt fatigued. And for the first time ever, I pulled up into wide legged headstand from wide legged forward fold. Trust the process, indeed! 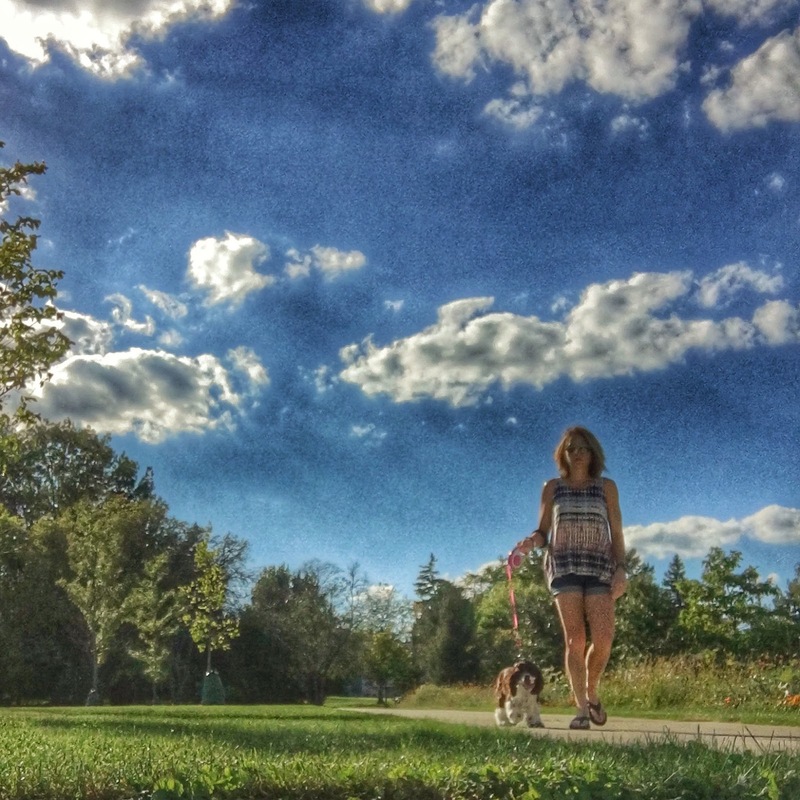 Oh, and there were some dog walks this week, too. How was your week? Any wins? Any TMI stories? Am I shameless? Will you ever come back to read my blog again? 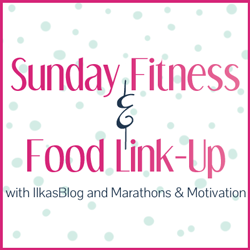 I'm linking up with Holly and Tricia for their Weekly Wrap as well as Angela and Ilka for the Sunday Fitness and Food LinkUp! Oof, I relate strongly to this story. You can't always help the GI situation, and its somewhat embarrassing in group runs to stop and take care of business... sometimes more than once. Maybe one day I'll have it figured out! And you hit the nail on the head as to why I don't run in a group. Altho at this point, I don't know that I'd be embarrassed anymore. Truly, I have no shame. Don't even get me started. Just... don't even get me started! See now, I'd totally run with you. Because you GET IT. I have been lucky (KNOCK WOOD) to not have much in the GI issue area during a run...now, before and after? That's a different story. I'm curious as to why you took a gel during that run - I thought you were only using Tailwind for fuel? I use gels on shorter runs. I didn't want to carry a handheld for this one. Good to know - I have been using only Tailwind for a couple of months now and so far, feel like it's enough. Plus gels make my stomach feel icky after the first one. I'm usually good for 2 gels but after than, I'm over it. I like Tailwind for anything longer than 10. No really, I'd rather have to pee. Trust me. Oh I am so sorry this happened to you! I'm not sure what I would have done, but good job being...creative? Love that you share this stuff on your blog. I'm always happy to share tips here on my blog! LOL! Talk about being unprepared. Glad those toilet paper rolls were available. And that there was plenty of wet grass! LOL oh man!!!!!! Despite having to wipe with cardboard and your hands, I would still call the situation a win because you did not crap your pants! What made your situation so dire do you think? Was it something you ate? I carry TP with me A LOT. Not crapping my shorts was a win! I was happy with my wardrobe choice of a running skirt and underwear. I had a couple of layers, just in case. I'll never leave home without it again. Let this be an example of what NOT to do. Okay 1. you're hysterical and 2. you poor thing! I think all of us have been there with potty issues so we can all relate. At least the rest of your long run went really well! You are not shameless and I'm for sure coming back to read your blog. And I'm going to continue admiring your beautiful pictures as well. You are so strong and sounds like a great week! I'm just grateful there was a portapotty! What if there wasn't? It could have been a disaster. No TMI stories. Glad you made it to the drop zone in time! Oh man what a moment when you realize no TP :( I squat just about anywhere to pee on a run but thankfully I have not endured quite a challenging situation that way. I relate though, I have barely made it in the door a few times! 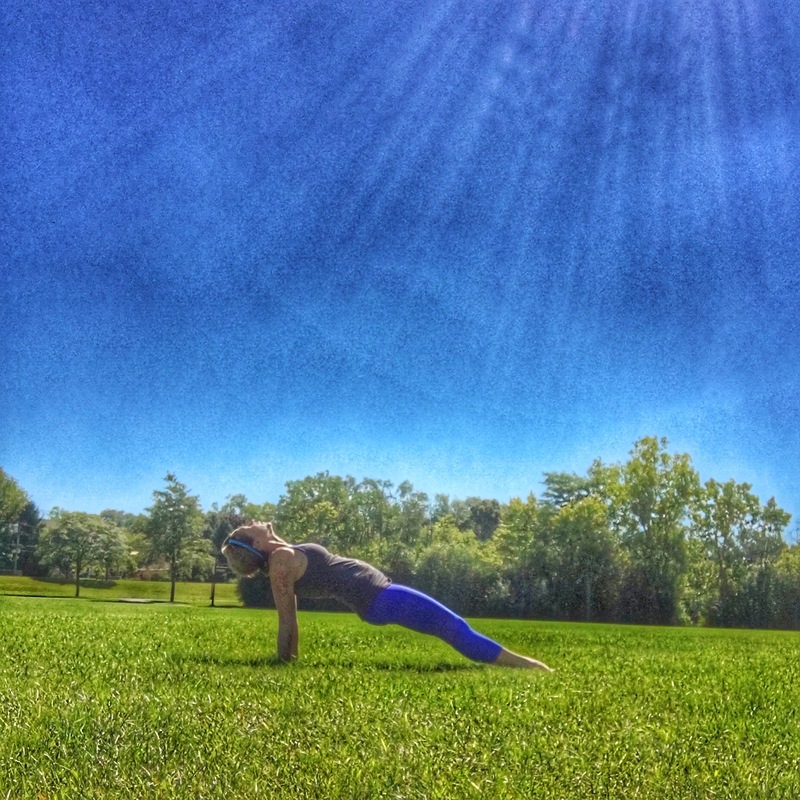 Love your face up plank! Yes, I'll be back Glad you will do PCB!! I hope I am running shape! I hope I am in running shape too! I signed up for the half with all the optimism in the world! I hope they have portapotties. I will never run a race without tissues. Ran a half - got a bloody nose - no tissues. Wiped my nose on both arms and then had to resort to my shirt - UGH! The Zombie look was pretty gross. I always bring wipes to a race but I don't usually bring them on a 10 mile run! Well, lesson learned. O girl that was totally a success! I have been in that situation before. I don't know what it is with me lately but I can't go 4 miles anymore without stopping to use the facilities. My goal for my 5k this weekend was to just get through it without having a potty stop! Bahahaha...let me catch my breath. Here's a little TMI. If you are completely desperate to clean up something super messy and have no toilet paper or other alternative...socks are amazing. Also, having a sister in law with Chron's I've realized that Tri shorts are the perfect solution for anyone needing a little help in that area. The padding is very absorbent. Again TMI. YAY -- Wendy's got her running groove back. Thanks for linking! PCB or bust. At least you found a porta potty! That in the bushes would've been...um...just no. I'll never leave home without my wipes! OMG!!! I have done the SAME THING in a porta potty void of toilet paper!!! When that Poop Monster hits it doesn't stop for anything. Very resourceful!! What if the rolls weren't there? Aye! Of course I didn't feel it was TMI because I'm the queen of TMI! I, too, have had to use the toilet paper roll when the roll is empty. A girl's gotta do what a girl's gotta do to get the job done. Now I ALWAYS carry two folded up paper towels in the front waistband of my shorts for emergencies. I pack them for runs or races just like my shoes. I used to use tissues, but they disintegrate with all the sweating I do - paper towels don't and work so much better. Good to know! The things I learn from my fellow runners..
Hello, my name is Suzy and I am a poo-a-holic. I love poo. It's fascinating, it's hilarious and entertaining. 99% of my posts include poo. Oh, then you'd love my job! I get to talk about poop all day long. Living the dream! Lol, glad you made it to the porta potty. Sounds like running is going well! Great job with your cross training too! You are so strong!! I do love my cross training! Most runners have no shame so you are in good company!!! I have absolutely done what you have an even in the woods. When you gotta go... :-) Love all your pictures this week and HOORAY for the headstand!!! A girl has to do what a girl has to do or poo! LOL! You story is funny and has happened to all of us! 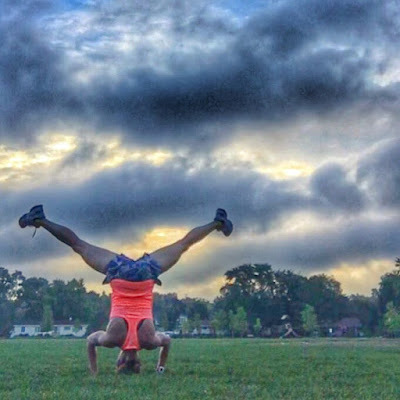 Great pictures this week too- that headstand is so cool- you are super brave and I would agree that cross training has paid off! It's been fun pushing past my limits! I had a run like that this summer. It was a 16 or 18k run and I just made it home. I was sprinting home and just made it on the door. It's a life changing moment, way to be creative with the paper roll! Glad to hear that your foot is feeling better this week. I have not had one of those urgent calls on a run yet. I guess you have to carry a pack of tissues LOL. Have a great week! ahhhhhhhhh. I really cannot with portapotties. You are stronger than I.
I'm really immune to Portapotty conditions. I was grateful for a place to sit. You do what you gotta do! "Civilized" is out the window when you're on a run and have issues. Sometimes I don't even know who I am anymore. Oh man, I saw the sign for Drop Zone and couldn't help but chuckle! You gotta do what you gotta do!! I always enjoy your weekly recaps. It looks like things are going great! My yoga instructor likes incorporating headstand practice so I'm hoping I'll be able to make some progress! I can't wait to see your headstands! Ha!! I love your honesty here... I had a similar scenario a few months ago- it's good we can laugh at ourselves. Oh the crazy things runners will do! Only my readers would understand! What a great story!! I'm glad you shared it. I'm still somewhat of a newbie when it comes to doing events, and what to do about stuff like that are the kind of things I wonder about. I've been running for 25 years and this stuff still rattles me! He's way smarter than me! Oh dear, I have so many historic TMI incidents. I find cycling has less impact on my GI system so no really recent incidents though. Back when I lived near a trail and would run in the woods, I may have had one or two occasions of doing as the animals do in the bushes off the trail...eek! That is a huge benefit to cycling! I never have these issues on a ride. The struggle is REAL. I have had some pretty epic experiences and have had to jettison items of clothing when there is no TP to be found! Now I carry a few napkins in between my bra and workout tank which might get a bit sweaty but SO much better (and cheaper) than using my clothes! But the sweat moistens the napkins, turning them into wipes, right? That is genius! yeah, I never even thought about that--you are so right!! love it! Haha! The long run story. I think most runners can relate to this and have done something similar at some point. 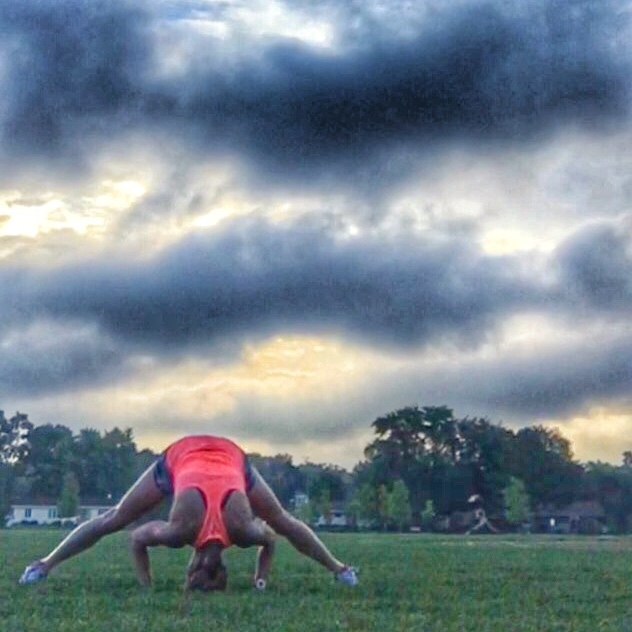 Good job on your yoga and getting into that headstand pose from forward fold! I love that I'm still making progress with yoga! At least you had a porta potty! Sometime you gotta do what you gotta do. :p Nice week of training and cool shot of you doing your dips! I've had a porta potty instance like that on a run before. Glad you were able to improvise and get it done. Love your photos! Oh no!! that sounds not good at all.... that has become a fear of mine for a while... to go into a portable toilet and have there not be any tp! But you made it work! Okay, I admit, I skipped to your yoga pictures! And they are fabulous as always! There's always that one person... seriously, I get it. My sons would be mortified if I told them this story! I appreciate the realness of this Wendy, we don't always share our TMI stories but that does not mean we don't all have them! Great job on being resourceful! 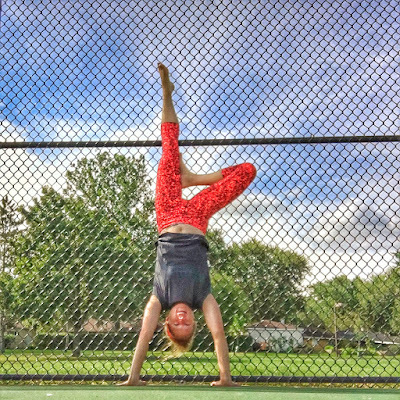 You are looking great in your hand stands and holy wow I know that wide stance up to a handstand is no easy task! Great job I'm glad you are seeing progress in strength in all this! I'm also glad for the commitment for PCB! I can hardly wait! It was too humorous, to me at least, not to share! A runner's gotta do what a runner's gotta do. Just imagine me . . . out there 2 1/2 hours for 11 miles! Thankfully it's very rare (like never, but I'm trying not to jinx myself) that I suffer with GI issues. I actually think you were quite clever. I've managed to get dog poop on my hands on many occasions yet I still don't carry wipes with me. My week at home was pretty good, the weekend sucked bigtime. I just hope it doesn't happen in Florida! But hey, I've laid the groundwork. Bahaha! I'm finding this refreshingly funny! Though I've never had that particular problem, I have had an issue with a certain "time of the month" while running with a friend. Fortunately we were trail running which provided some privacy to take care of things. Guess I don't have that problem anymore since old "Aunt Minnie" has come along! :) Thanks for keeping it real!!! Let's see, you're a nurse practitioner, a mom (to boys, no less), and a runner...triple threat! There is NOTHING off limits for you! Story of my life! Pretty much! I spend most of my days talking about poop. Living the dream! The humidity is through the roof here as well, worse than July and August!! 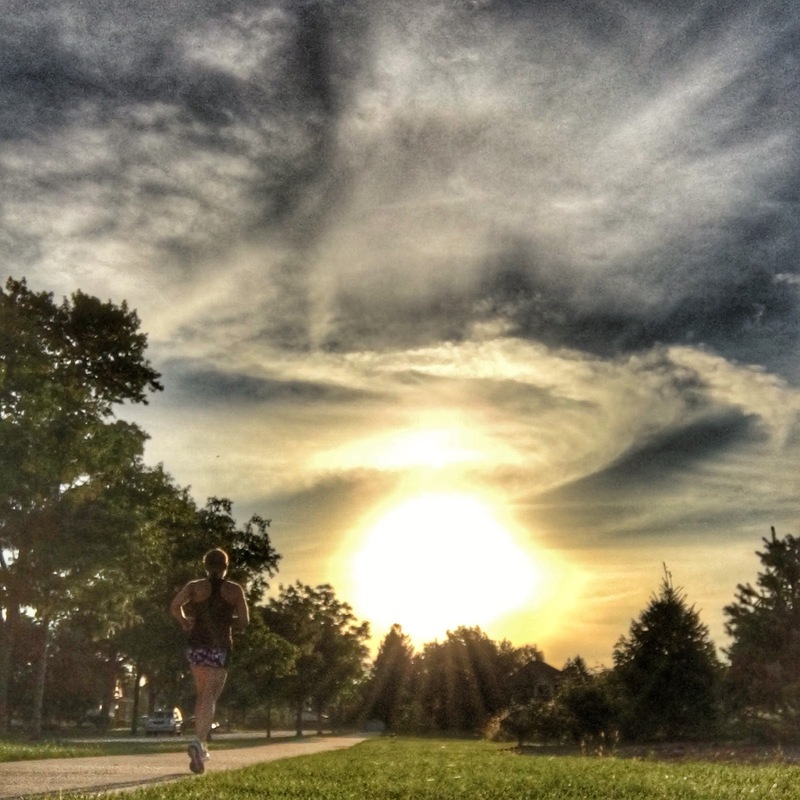 I hope you'll soon enjoy cooler temps for running! Great training week as usual - I don't think you ever had a bad one. But see, if I didn't share my mishaps, it really would never look like I had a bad week... gotta keep it real. I've left behind a sock once and another time a glove, desperate times call for desperate measures. It is all part of the runner's story! Haha! Whatever it takes to keep running, right? Been there, done that. Well, not the cardboard part;). Sounds like a great week! And I'm with you - where is fall??? I'm not complaining, but where is it? Are we going right to winter? OMG - it is the worst when portapotties are not adequately stocked. Way to go on making do with the resources that you had! I love how you used the dew in the grass to wash your hands afterwards. That is a very clever idea. LOL at the smiling dog walkers, too. It is funny how life works that way. Totally agree with you on appreciating summer's lingering warmth, but being ready for cooler running temps!!! It was my little secret. The dog walkers had no clue. 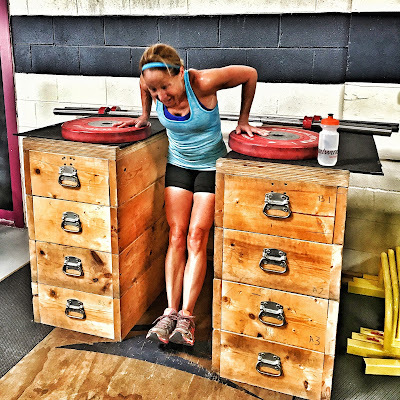 There's no shame in talking about GI issues between runners! 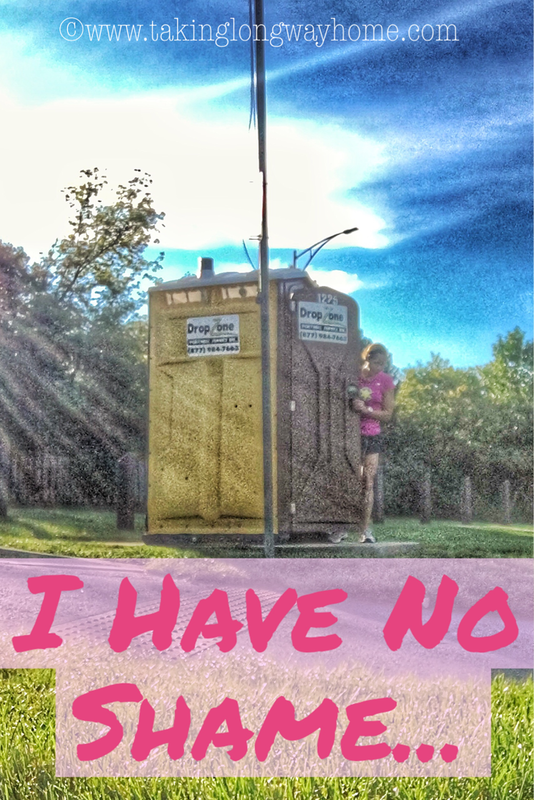 It surprises me more when runners don't have the experience of having to go in a portapotty or the woods. There's times when backpacking/camping that the woods are nicer than the little camping toilets - those are gross. at least you had a portapotty :) that is pretty much unheard of here. you find a bush or you hope that nothing escapes. This is why I wear a "long" nighttime sanitary pad on long runs ;) ya never know hahahaha! This portapotty is there year round, which is really nice. Most of them go away in October, which is really bad if you're doing a long run in the winter! I never think of myself as graceful, so I'm going to take your comment to bed with me! Thank you! You have to do what you have to do! I once had to go in the woods and there was nothing to use, so I used one of my "hot hands" hand warmers (those disposable things). So gross. Glad to hear you are running consistently again! Yep, desperate times call for desperate measures! I would have used those hot hands warmers too! Oh, hahaha! Porta potties can be the worst. You gotta do what you gotta do! Great job getting those workouts done! Sounds like you are headed for a great half! Now that it's cooler out, my runs are so much better! Glad that you are back to running more and feeling good! Also, excited for you to do the Panama City Half, look forward to following your journey!!! Wow, your running story/portapotty incident sounded awful. My race on Sunday was a bit of a problem for me as I should have gotten out of the corral to take care of business. But I thought it was too late and ran for over 2 hours needing to go. It was awful, but thankfully a port potty with tissue was available and made me feel so much better. 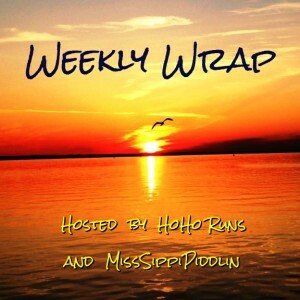 So exciting that you signed up for Panama City with some of the Weekly Wrap girls. I am gonna say it right now that I am a bit jealous. I know you will all have a blast! I love any kind of runner meetup! A group of us are spectating at Chicago and that will be fun too!